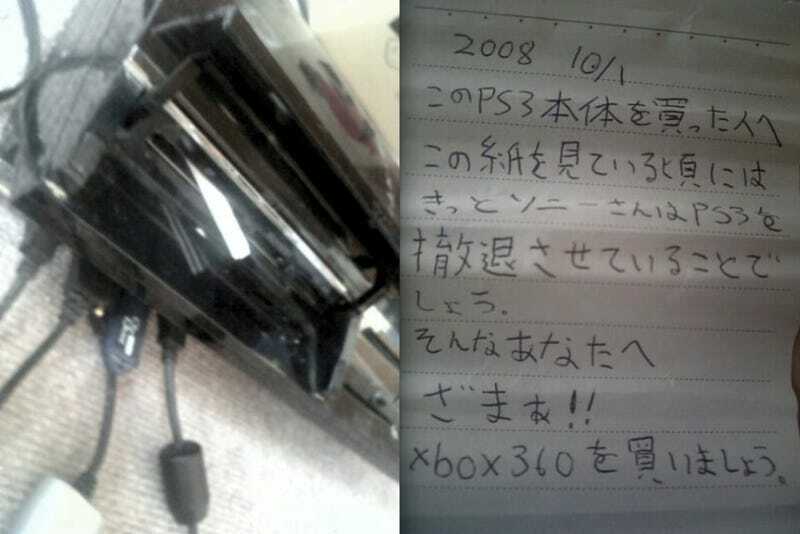 Former PS3 Owner Trolls Customer With Letter? For those who don't have an original PS3, there's a lid covering the slots on the console's front. Slots that are perfect for mini SD cards or — better yet — letters. That's exactly what was found in one PS3. Recently, a Japanese gamer bought a used 60GB PS3. Apparently, the guy found a folded piece of paper in one of the slots that somehow slipped by the game shop staff. The letter is dated October 1, 2008 and is addressed "to the person who bought this PS3." "By the time you read this, Sony will be withdrawing the PS3," the letter reads, going on to recommend the purchase of an Xbox 360. Sony, of course, did nothing of the sort with the PlayStation 3, even though the years following the console's launch were rocky. This letter was apparently penned in 2008 when the Xbox 360 had Japanese exclusives like Tales of Vesperia, a role-playing game that later went multi-platform, so perhaps, Xbox 360 owners were overly optimistic? Or maybe this letter is ironic? Or maybe it's just fake. Japanese netizens are quick to point out that the handwriting looks "childish" and "stupid".